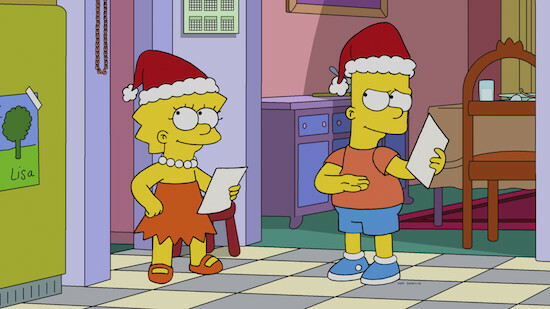 ‘Ts the season for a SIMPSONS holiday episode! Jane Lynch guest stars in the episode, as the family tries to salvage their Christmas experience. THE SIMPSONS: After a failed Black Friday shopping spree, Marge is determined to fix Christmas. However, Homer and the kids surprise Marge with a vacation to a Florida resort in the all-new “’Tis the 30th Season” episode of THE SIMPSONS airing Sunday, Dec. 9 (8:00-8:30 PM ET/PT) on FOX. THE SIMPSONS ™ and © 2018 TCFFC ALL RIGHTS RESERVED.